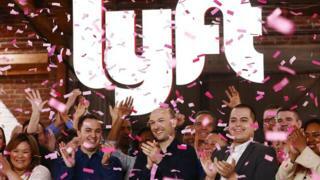 Shares in Lyft closed nearly 9% higher on the ride-hailing firm's first day as a listed company on the Nasdaq stock exchange. The firm's stock rose from a starting price of $72 each to finish at $78.29, valuing it at $25.4bn (£19.5bn). The initial public offering (IPO) has made multi-millionaires of the seven-year-old company's founders, Logan Green and John Zimmer. The company's shares initially surged by 21% to nearly $87 in early trading. The IPO is seen as a litmus test for a number of technology flotations that are expected this year, including Lyft's bigger rival Uber, which could be valued at as much as $120bn when it lists its shares. Lyft's business is built on the premise that having a car is expensive and as more people move into urban areas, they are shifting away from owning a vehicle to using services to get around. Lyft says it has a 39% share of the ride-sharing market in the US, up from 22% in 2016, but still below Uber, which is still the industry's biggest player. He told CNBC: "We're not needing to pull away from markets, we're going at the right pace, we're going deep in transportation, deep in the markets we're in. That has allowed us to gain the market share that we've gained and [global growth] is a great call option down the road." At the flotation price, Mr Green's stake was worth about $600m, while Mr Zimmer's was valued at $415.8m.